Perfectly situated within seventy acres of private land on the banks of the Njageteck River in the Mara North Conservancy, Richard’s River Camp allows for total privacy and exclusivity with superb game viewing. Between July and October the Great Migration takes centre stage as a million wildebeest pass through this landscape with plenty of drama and predator action. Outside the migration season its resident game never fails to impress, this is one of the most alluring aspects of the camp. The Ngoyanai Springs provide a permanent water source, drawing large numbers of animals to the area around the camp all year round. It is particularly renowned for its resident lion pride which can be seen and heard often around camp. Richard’s River Camp’s excellent Maasai and Samburu guides have an abundant and intimate knowledge of the Maasai Mara, its wildlife and its people. Daily guided activities include day and night game drives, birding, scenic bush walks, sundowners and cultural visits to a local Maasai village can also be arranged. Capture a bird’s eye view of the glorious landscape with a scenic yet thrilling light aircraft or hot air balloon flight over the Mara, and day trips to Lake Victoria can also be organised to make this experience unforgettable. 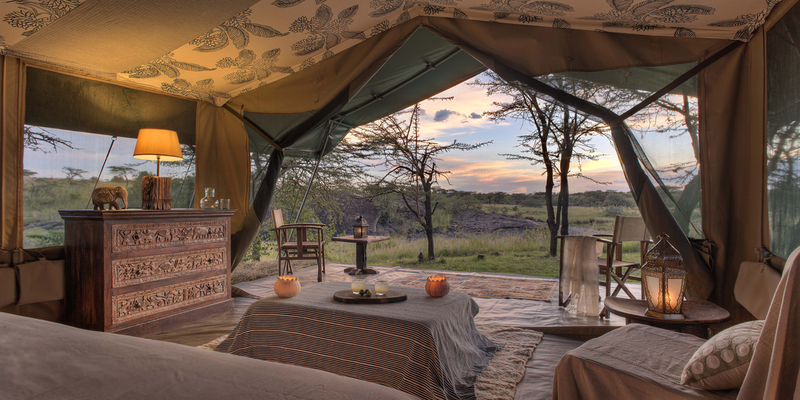 Richard’s River Camp is a traditional tented camp designed in true African safari style with modern amenities. Consisting of only seven canvas tents built atop raised wooden platforms, it is ideal for individuals, families and groups wishing for exclusive use. Large, custom designed tents are appointed with beautiful furnishings and feature en-suite bathrooms and large verandas overlooking the river. A silent solar power system supplies power 24hours a day. The main mess tent, comprising of a lounge and dining area, bar, small library and veranda, is wonderfully furnished with stunning views out to the surrounding bush. Richard’s River Camp is small, intimate yet luxurious and guests truly get individual attention and homely hospitality. Meals are often taken outside and the cuisine is outstanding thanks to the chef’s extensive culinary experience.